Hans-Joachim Roedelius’s discography reads like a dazzling, uncompromising vector that traverses one of the most important eras of cultural and musical history in post-war Germany. His most prominent projects include working in famous Kraut bands with Conrad Schnitzler and Dieter Moebius—the short-lived Kluster trio, its Schnitzlerless incarnation, Cluster, and later Harmonia—and he also produced many solo records and a fascinating constellation of collaborative albums with artists like music polymath Brian Eno. Moebius’s death in July of this year gave us an opportunity for proper reflection on the import of his records. The Harmonia box-set recently released by Grönland Records is one such timely touch stone, and it coincided with Hans-Joachim Roedelius’ recent retrospective series of concerts at Berlin’s Haus der Kulturen der Welt. We sat down with the man and let him walk us through the records himself. 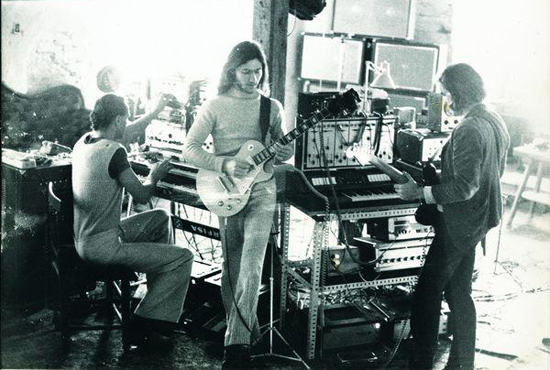 “Having Michael [Rother] in the studio changed the focus automatically. For us, the place where we were recording was also a big influence. The surroundings were beautiful: trees, the river passing by, chicken and geese. It was a nucleus. It influenced us to move away from industrial music to real songwriting. It was not only the landscape, but also the friendship and the community that was happening there. You had to work, you had to go to the forest to cut wood, you had to bake your own bread. You really had to get in contact with the earth. It was the first time that I could settle down from my hectic life. I had to leave Berlin in 1943 as a child because of the bombings, so for us there was nothing. We were always changing places, always on the road. And this was really exhausting! So I was really happy to get my feet on the earth. We had our own little utopia there and could do what we wanted to do. No one was there to make something out of us. It was the music itself which brought on titles like ‘Sehr Kosmisch’. It was structured music in that it had melodies, but it was also open and somewhat visionary. And tracks like ‘Hausmusik’ reflected the role of the community in our records. The song was born when we really connected to this house which we had to build. We had to do everything ourselves: build our toilets, make the mortar for the house. It was the most beautiful record we made, I think. “We toured Musik von Harmonia, and during the performances we discovered certain structures that we enjoyed revisiting. The shows helped us discover some models for real songs, which we then worked on for Deluxe. After two years of touring together, it was evident that we should record something else. Michael [Rother], of course, also had new ideas to be developed. Mani Neumeier [frontman of Guru Guru] also joined us and brought some new ideas and influence. We also recorded with Conny Plank for this record. He came in with his mobile studio and most of the material was done with Conny recording and Mani drumming. It was the first time we recorded with Conny as Harmonia, although we had worked with him previously as both Kluster and Cluster. Conny had great humanity. He was a dear friend, and he didn’t seek to make money. He saw recording and producing as the key challenges, which was unusual for producers: they are always looking at how to market and manipulate music so people buy it. I’ve worked with many producers, but Conny was just different. His techniques and abilities were superlative and he was a musician as well, so he had a great sensibility. 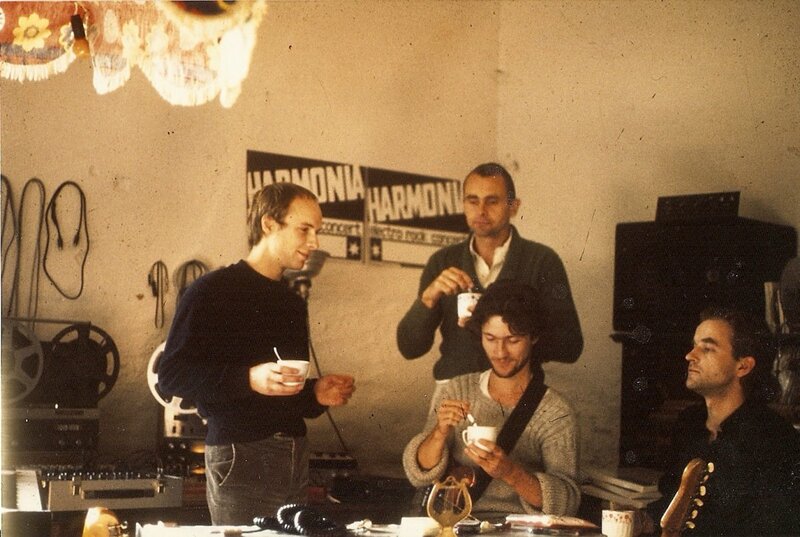 “When Brian Eno arrived in 1976, Harmonia wasn’t a band anymore. Michael was there, Cluster was there, but we were no longer making music. We first met Brian at a Harmonia concert. He suddenly appeared one day after we invited him in 1974. It took him two years to finally work with us. So while Harmonia didn’t exist anymore, it reformed for this one project. Tracks & Traces was the swan song for Harmonia.